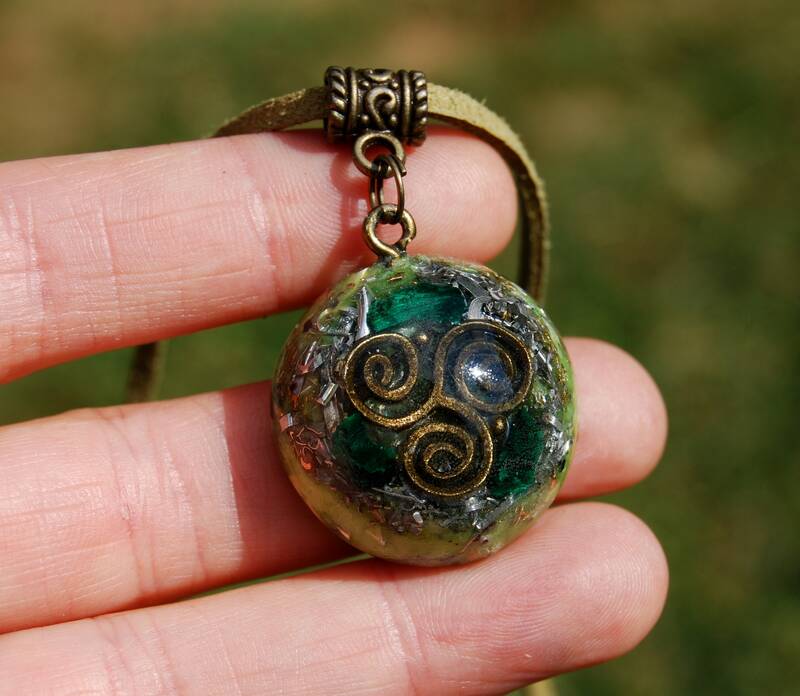 This lovely 2.7 cm / 1.1" in diameter Orgonite® pendant, brass, aluminum and copper shavings. 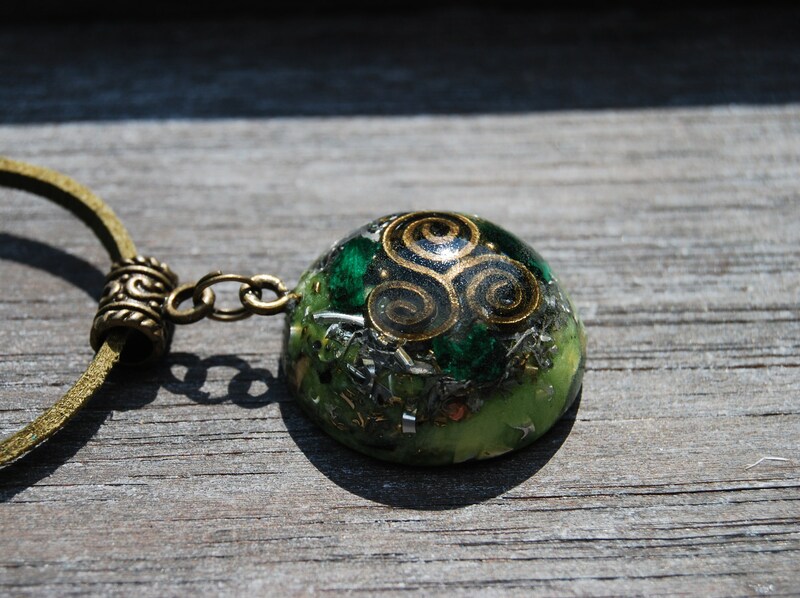 It also contains raw Malachite (in the front), Pyrite (to enhance), black Tourmaline (to protect and ground excess energy) ,Rhodizite (to enhance) and clear quartz all within a durable resin setting. 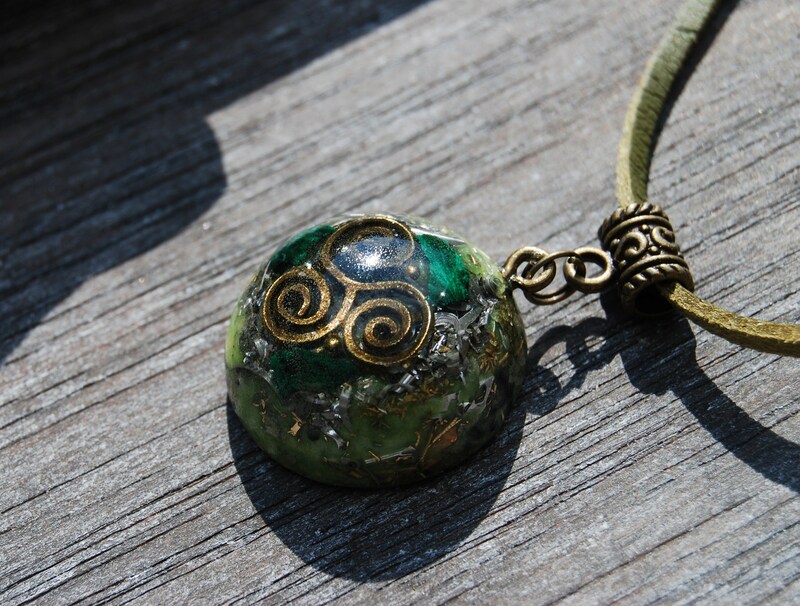 It has a gold Triskelion symbol in the front. 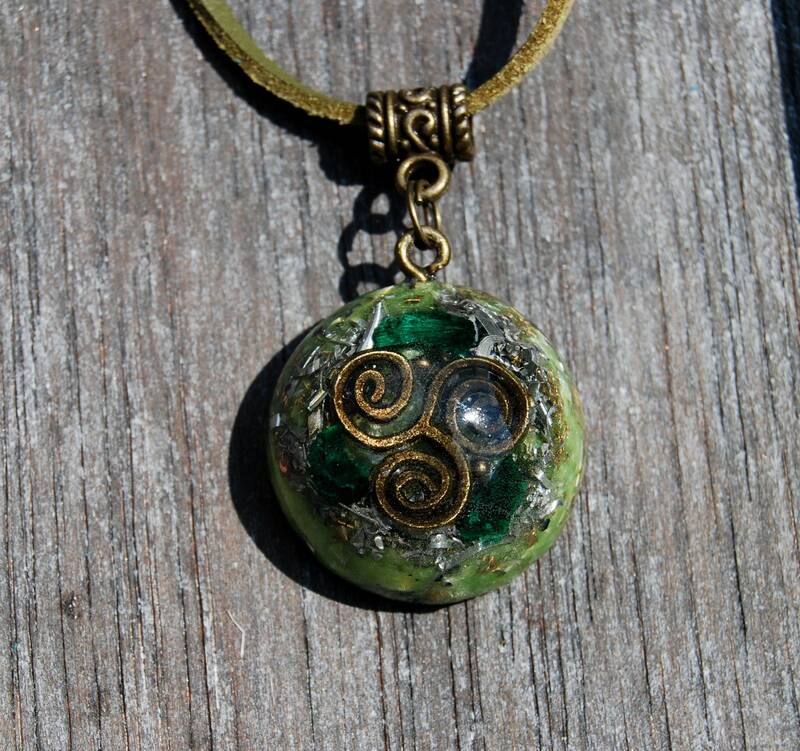 Derived from the Greek word "Triskeles" meaning "three legs", the Triskele or Triple Spiral is a complex ancient Celtic symbol. Firstly, the triskele can be thought to represent motion as all three arms are positioned to make it appear as if it is moving outwards from its center. Movement, or motion, is believed to signify energies, in particular within this Celtic Symbol the motion of action, cycles, progress, revolution and competition. Secondly, and the more challenging area for symbolists, is the exact symbolic significance of the three arms of the triskele. This can differ dependent on the era, culture, mythology and history, which is why there are so many variations as to what these three extensions in the triple spiral symbol mean. Some of these connotations include: life-death-rebirth, spirit-mind-body, mother-father-child, past-present-future, power-intellect-love and creation-preservation-destruction to name but a few. It’s thought that through the combination of these two areas we gain one meaning of the Celtic triskele. It is believed to represent a tale of forward motion to reach understanding. 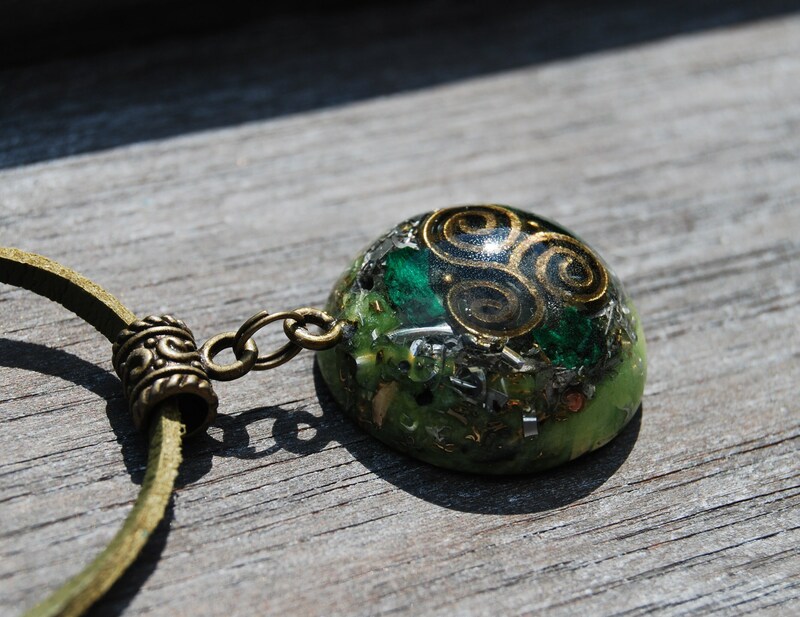 However, this is thought not to be the only meaning, as it is also believed to represent three Celtic worlds; the spiritual world, the present world and the celestial world. Like the ancient Trinity knot, the number 3 holds a special symbolism within the triskele. It is based on 50/50 ratio (50% metal/50% resin) which is required for the orgone device to properly work according to William Reich's research. Selenite is particularly effective in stabilizing the emotional body and bringing erratic emotions under calm control.